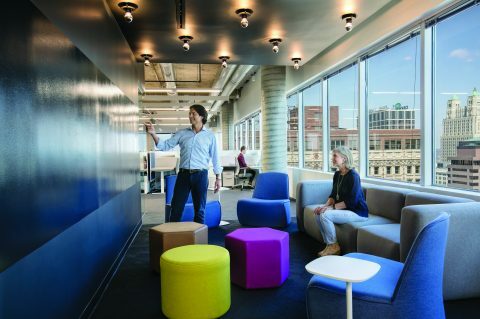 FOCUSED ON GIVING WORKERS SPACE THEY NEED TO EXCEL, INNOVATIVE COMPANIES ARE REMAKING OFFICES TO FIT THEIR UNIQUE MISSIONS. Something profound is unfolding at workplaces across the country and around the world. And for good reason: Older Millennials have been voting with their resumes for the past decade, elevating workplace design considerations on their own hierarchy of career needs, and employers that don’t measure up find themselves continually posting help-wanted ads. In many cases, cubicle farms have been plowed under for much of the past decade, giving rise to more open, engag-ing workspaces with options that compel more movement throughout the day, promote more interaction with co-workers, help employees in their prime child-rearing years balance work and family, or help the singles among them balance work and their interests outside the office. Those spaces are greener. They have better lighting. At larger companies, on-site restaurants have replaced armies of vending-machine sentinels. It’s vitally important, say human resources executives and workplace designers, for smaller business owners to understand what’s about to happen in their work spaces. It’s well-known that Millennials are now the largest single demographic cohort in the work force. Less appreciated is that the trend is going to continue: the youngest of them are, in general, high school seniors today, so more than 20 percent of that generation’s members are yet to enter the full-time work force. 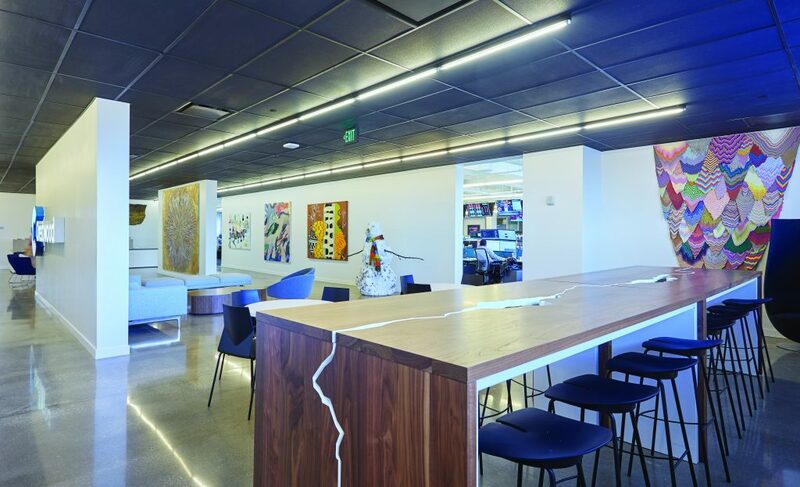 But there’s far more to nailing workplace design than grasping for trendy ideas. 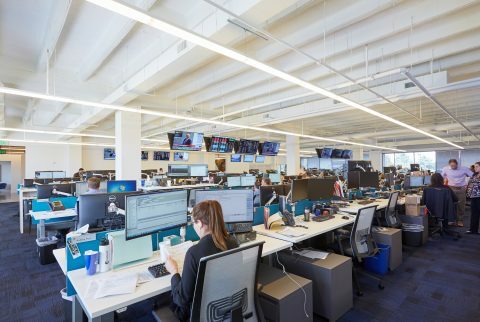 If you want to engage a work force and infuse a sense of mission and purpose, a workplace should be a physical manifestation of the corporate narrative, design professionals say. 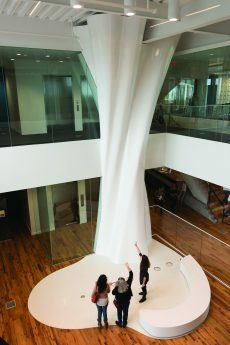 “Almost everybody we work with who has their own mission statement, knows their elevator speech, but when you get into a room that will manifest into built space, then you can have have real conversations about what that is, because everybody’s interpretation is a little different,” says Tucker Trotter, CEO of Dimensional Innovations. 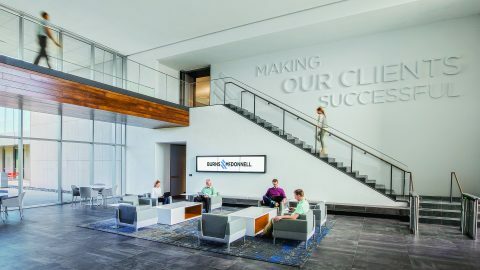 His Overland Park company is a national leader in high-design storytelling and branding of physical spaces for companies, universities and public facilities. As you look around at new office construction and workplace rehab projects, some common themes are emerging, but some stark differences are, as well, depending on the type of work being done at a company. One that has global operations, for example, will have different needs for employees working non-traditional shifts. What’s cool and trendy in a financial-services setting might not fly in blue-collar settings. So some interesting customization is taking place. Take Burns & McDonnell. 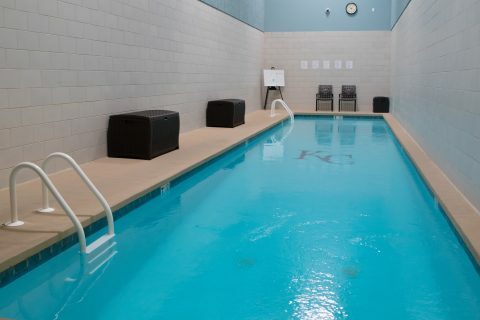 The design and construction giant completed the $74 million, 310,000-square-foot expansion of its global headquarters expansion by leaving little out when it comes to amenities. Already considered a career destination for qualities like employee ownership, company-paid health insurance covering nearly 80 percent of premiums (insurance that starts with part-timers pulling at least 30 hours a week) it incorporates an on-site pharmacy, a 20,000-square-foot MacKids Learning Academy, a day care for employees with preschoolers, expanded credit union, coffee bar with barista, adjustable desks, electric charging stations in the park-ing garage, and an expansive cafeteria with fresh menu items prepared daily and more. It was a classic example of drawing on employee desires and talents—the design and construction was all done in-house. The goal for many such employers is changing the concept of a workplace from just that—a place to work—and making it more of the place to be. That’s especially the case when collaborative work arrangements that are becoming more popular also contribute to employees socializing as groups. 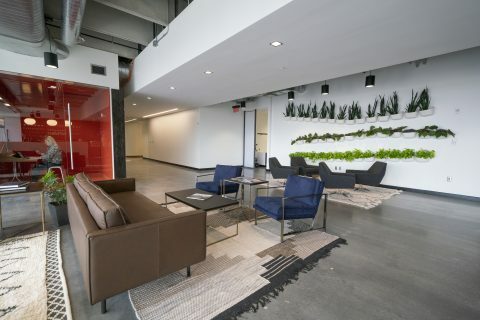 Spring Venture Group, which has plans to hire 1,000 workers over the next few years and put them in its new Downtown headquarters, has already unveiled the first spaces for workers at 12 Wyandotte Plaza, remodeled by Rau Construction. Packed with amenities across the seven stories (and 130,000 square feet), it infuses vibrant color schemes and open spaces envisioned by the design firm Clockwork into an otherwise drab Downtown setting. A lot of attention is being paid to the concept of shared workspaces, relaxation areas and even some recreational space. 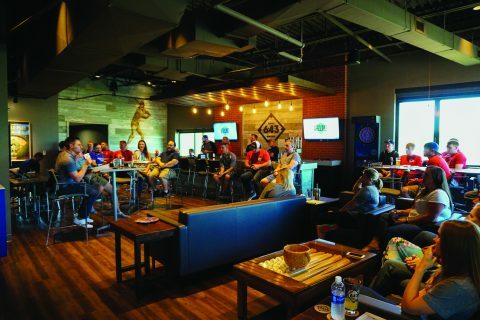 While that is going on inside the businesses, developers on the outside are focused on creating more venues for those innovative employers, especially along the lines of public transportation, with access to restaurants, nightspots and entertainment venues as well as schools, pharmacies and dry cleaners. Some high-visibility examples of that are the development of Corrigan Station by Copaken Brooks in the Crossroads area, the largest Downtown office project in roughly 25 years. 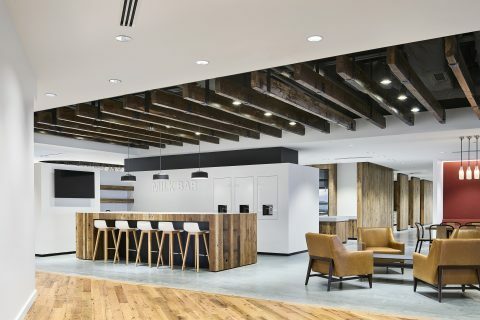 It filled quickly after opening in 2016, and is home to insurance brokerage Holmes Murphy & Associates, Hollis + Miller Architects, co-working space WeWork, and payment-solutions provider CardConnect. 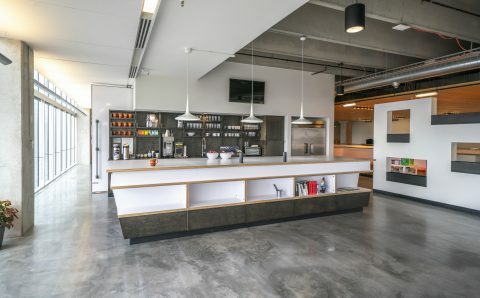 With the streetcar line running adjacent to the 10-story property, employees from those companies enjoy open floor plans, natural lighting, 11-foot ceilings and an adjacent parking garage, and on-site caffeine fix from one of The Roasterie’s locations. At Sandbox, the River Market advertising and marketing agency, core values underpinned the design, say managing partners Ethan Whitehill and Chad Smith. “We have a central value, the idea of collaboration,” Whitehill says. “First and foremost, the space had to be collaborative; that guides the actions of the company. 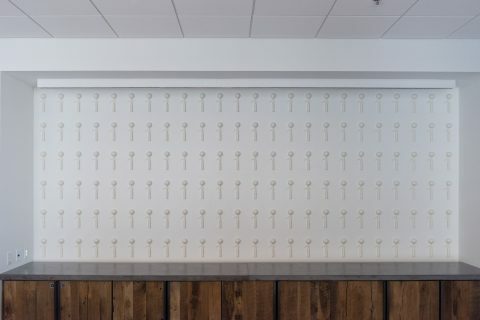 The objective was to make Sandbox a haven of collaboration for difference makers, so we zeroed in on ‘haven.’” Still, he said the Three P’s of workspace had to be factored into the work done by Centric Projectgs and Crawford Architects: Privacy, permission and proximity. “Collaboration is a great goal,” he said, “but at the same time, there are open and private collaborations where people at times need to separate themselves.” The second and third floors of the building have, essentially, separate missions, and the spaces reflect that, with one clearly a place where the heavy creative lifting is done, and the other with more of hotel lobby feel, with a sprawling and well-appointed coffee bar at its core, inviting more meaningful conversations than you’d get a water cooler. Today, these types of workplaces are at the front edge of employment trends, workplace experts say. But their status as outliers will be short-lived—before long, such work environments will be table stakes in a continuing battle to attract top talent, and keep those employees in place. 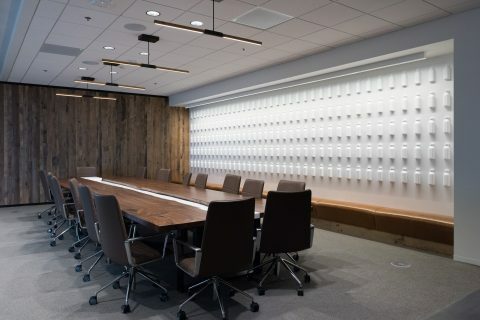 In a new building, workplace design starts with a blank canvas. Remak-ing existing space? Rip and renew. But what about creating a smaller footprint? Will Moore can tell you. He heads the Kansas City office for Houston-based Crestwood Equity Partners, the energy-trading firm that relocated from its Country Club Plaza digs over to Crown Center. 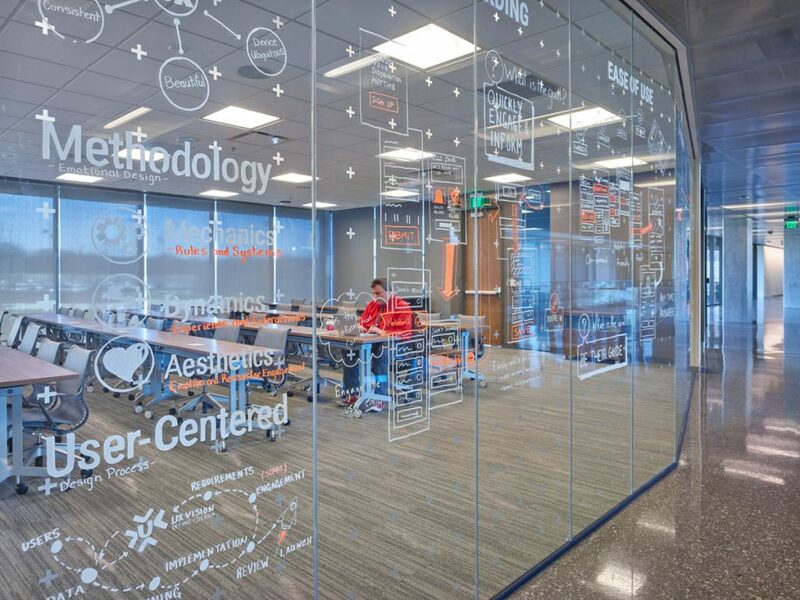 Because it was a square-footage re-duction, he said, the goal ”was to make the most efficient use of less space, while at the same time, creating more collaborative spaces for our employees.” That’s where the business model dictated. 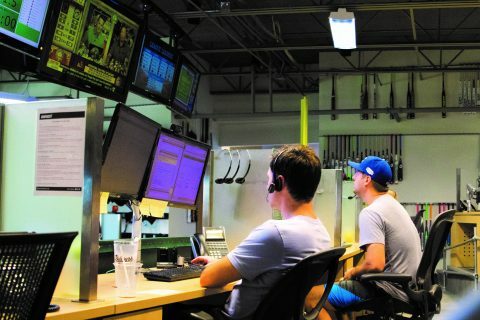 “Since our business is a fully-integrated service model, it is important to have employees in constant communication with each other,” he said. A trade floor that allows respective groups to be aligned and communicating lets them do that, and see what’s happening in the physical and financial markets to execute the business plan. “The trade floor accomplishes this with the availability of real-time data and employees in close proximity to one another,” Moore says. 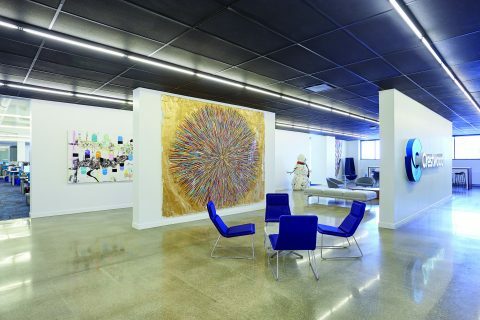 In addition, Dimensional Innovations helped drive the brand with creative tables that replicate a shale-oil play, and the office is decorated with pieces from the extensive art collection of former office manager Bill Gautreaux.